The newest Food Facts Friday post is all about corn. One of the wonderful things about corn is all the different ways it can be prepared and eaten. Include corn as a side at a cookout, barbecue or with a meal at home, mixed into a salad, ground into cornmeal to make bread or tortillas, or popped into popcorn. One serving of frozen or canned corn is usually 1/2 cup. If consuming corn on the cob, one serving is considered one small corn ear (5.5-6.5 inches long). Nutrition facts will vary depending on the form in which corn is being eaten. Some vitamins and minerals corn provides include vitamin A, vitamin C, folate, niacin and magnesium. Like other whole grains, corn is a great source of fiber. Frozen Corn: 1/2 cup of frozen sweet corn contains 75 calories, about 2 g protein, less than 1 g fat, 16 g carbohydrate, 192 mg potassium, 65 mg phosphorus, 1.5 g fiber and 1 mg salt. Canned Corn (no salt added): Canned corn may be higher in calories, sugar, and salt than frozen or fresh corn due to additives. Creamed canned corn usually has added sugar. Half a cup of canned corn contains about 100 calories, 2 g protein, less than 1 g fat, 1.5 g fiber, 4 g sugar, 4 mg sodium, 195-220 mg potassium and 67-92 mg phosphorus. Corn on the Cob: 1 small ear of corn (5.5-6.5 inches long) contains 63 calories, 2 g protein, 1 g fat, 14 g carbohydrate, 1.5 g fiber, about 5 g sugar, about 195-220 mg potassium and 67 to 92 mg phosphorus. Popcorn: Three tablespoons of popcorn kernels is equal to about 4 cups of popped popcorn, which provides 110 calories, 3 g protein, 1.5 g fat, 22 g carbohydrate, 4 g fiber, 96 mg potassium and 116 mg phosphorus. Does corn fit into a kidney-friendly diet? Yes! Corn is generally okay to consume on a kidney-friendly diet. Due to phosphorus content, remember to pay attention to portion sizes and consider what form of corn you are consuming. Some types of corn that are processed or prepared with other ingredients, such as cornmeal, cornbread and corn chips, are higher in phosphorus than other forms of corn, such as popcorn. Corn is considered to be an affordable food, but cost does depend on where you are shopping and what form you are purchasing corn (fresh, frozen or canned). One can of corn usually costs less than $1.50. The average retail price of frozen corn is about $1.62 per pound. Thirty ounces of popcorn kernels costs $2 to $3.50. The price of corn on the cob will likely vary depending on season and where you live, but is usually about $0.50 per ear. Corn is extremely popular and grown in different varieties all over the world. It is most commonly yellow in color, but may also be white, purple, blue, red or even black. Since the corn husk should not be removed in the store to look at the corn, it is sometimes difficult to know if you are choosing good, fresh corn on the cob. Here are a few tips when choosing fresh corn on the cob. First, inspect the husk, which is the green shell covering the corn. The husk should be vibrant green without any holes and should be tightly wrapped around the corn ear. Second, look at the tassels. The tassels should be brown and slightly sticky feeling, not black or dry. Third, feel the corn through the husk for any holes or missing kernels. When choosing canned corn it is best to look for cans with no added salt. When purchasing popcorn it is best to buy the kernels and pop the popcorn in a paper bag in the microwave, on the stove or in an air popper at home. Prepackaged ready-to-pop popcorn usually has added salt and fat. Avoid packaged ready-to-eat popcorn that is cheese flavored due to higher phosphorus and sodium content. Good choices of ready-to-eat popcorn include plain popcorn or very lightly salted popcorn. Corn on the cob should remain in the husk and stored in the refrigerator until ready to prepare. Corn on the cob without the husk is also available in the grocery store. It is usually found in packs of 4 for about $2.00. Keep it in the plastic in the refrigerator until ready to prepare. Fresh corn can remain in the refrigerator for up to one week. Canned corn is the easiest to prepare since it is ready to eat as soon as the can is opened. You can warm up the corn on the stovetop in a pan or in the microwave in a microwave safe bowl. Frozen corn is also fairly simple to prepare since it only needs to be thawed and warmed. Two simple ways to do this are either in the microwave or by steaming. To microwave, pour corn into a microwave safe bowl and microwave for 1-2 minutes. To steam frozen corn, add 1-2 inches of water to a pan and bring to a boil. Then, place steamer containing corn on top of pot, lower to a simmer, cover pot and steam corn for about 3-5 minutes. Corn on the cob is also relatively simple to cook. Personally, I boil the corn on the cob as this is easy and fast. Begin by husking the corn and removing all threads. Next, fill the pot about halfway with water. Make sure there is enough water in the pot so that when the corn is added it is completely submerged. Bring the water to a boil, then add corn on the cob and cover with a lid. Wait for the water to return to a boil, then remove from heat, keep pot covered and let stand for 5 minutes. Corn on the cob can also be grilled, which is a great way to prepare corn in the summer! Begin my heating an outdoor grill. Shuck corn and add desired seasonings such as butter or olive oil and pepper and a small amount of salt. For a sodium-free spicy corn on the cob try olive oil with harissa or chili powder (which is my personal favorite). 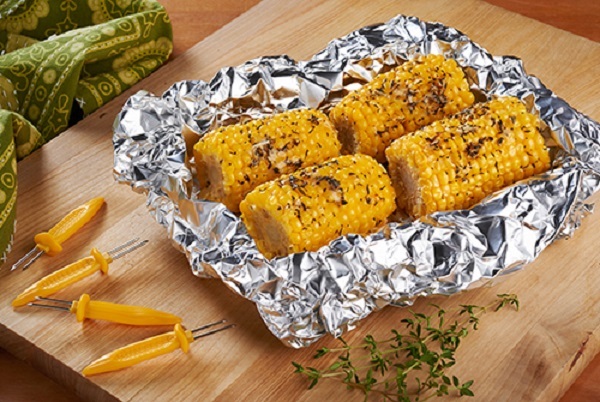 Wrap ears in aluminum foil and place on the grill. Turn occasionally and grill for about 18 to 20 minutes. Click here for additional kidney diet tools and resources from DaVita. Byrd-Bredbenner, C., Moe, G., Beshgetoor, D., Berning, J. Perspectives in Nutrition, 8th edition. McGraw Hill Higher Education. New York, NY. 2009. P. 157, 161, 171-172, 174-175. United States Department of Agriculture. National Nutrient Database for Standard Reference Legacy Release. April 2018. https://ndb.nal.usda.gov/ndb/foods/show/11772?man=&lfacet=&count=&max=25&qlookup=canned+corn&offset=&sort=default&format=Abridged&reportfmt=other&rptfrm=&ndbno=&nutrient1=&nutrient2=&nutrient3=&subset=&totCount=&measureby=&Qv=1&Q328338=0.5&Q328339=1&Qv=1&Q328338=1&Q328339=1. Accessed June 4, 2018. Warshaw, B. How to Choose an Ear of Corn (Without Peaking!). Food52. August 8, 2013. https://food52.com/blog/7700-how-to-choose-an-ear-of-corn-without-peeking. Accessed June 5, 2018. Phillips, C. Tip: How to Choose The Best Sweet Corn. Kitchn. July 5, 2017. https://www.thekitchn.com/tip-how-to-buy-1-25963. Accessed June 5, 2018. Cunningham, M. Basic Method for Cooking Corn on the Cob. Epicurious; The Fannie Farmer Cookbook. September 1996. https://www.epicurious.com/recipes/food/views/basic-method-for-cooking-corn-on-the-cob-40047. Accessed June 5, 2018. Sueteistma. Grilled Corn on the Cob. Allrecipes. https://www.allrecipes.com/recipe/20724/grilled-corn-on-the-cob/. Accessed June 5, 2018. Krista believes eating well is an essential component of living a long, healthy and happy life. She has been with DaVita for over one year and has been working as a clinical dietitian in the Washington, D.C. Metropolitan area for almost four years. 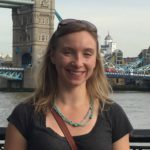 Krista is a certified nutrition support clinician and is taking classes for a master’s of science in applied nutrition. She enjoys being part of a strong team of renal medical experts at DaVita. In her free time Krista loves traveling, cooking, reading and staying active. Very happy to no we can enjoy Summer Corn on the Cob !!! Thank You!! Wow! I wish I could eat corn. I lost my teeth from Sjogrens, well actually because ins. stopped paying for my root canals/crowns. So they made dentures that won’t stay in no matter WHAT adhesive, etc. I use. I can’t eat much anymore and can’t go out looking like this. Don’t give up. Ask your doctor and dentist about resources that may help with fixing your dentures or getting new ones. Your insurance may reconsider–especially if you show the impact this has on your health. The American Heart Association states it is safe to eat an egg a day. However, egg whites do not have as much of the fat and cholesterol that the yoke does, so egg whites can be enjoyed more often. Avocados are high in potassium, so use caution. Broccoli is generally safe on a renal diet, keeping in mind that a serving of fruit/vegetables is about 1/2 cup. Check with your doctor on consuming wine, since there are medications that may interact with alcohol.